Is Guild Wars 2 Down Right Now? There are currently issues with login on the Guild Wars 2 forums and we're working on a fix. Sorry about the inconvenience! @GuildWars2 gem store down? just keep getting a quickly flashing "error has occurred" when trying to buy gems. Might not be able to stream today. My internet is lagging. It's strange that I never lag outside of trying to stream guild wars 2. @GuildWars2 I can't purchase your game :( I have the money but it keeps giving me that 1 second error try again message. 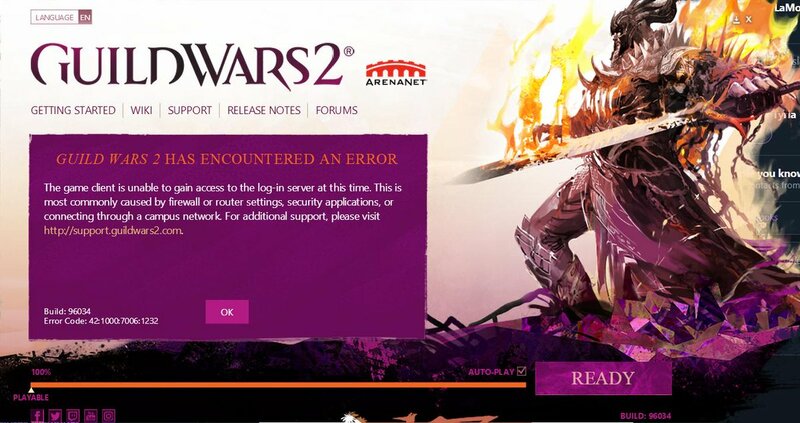 @GuildWars2 Europe login server down - do you have any clue why?